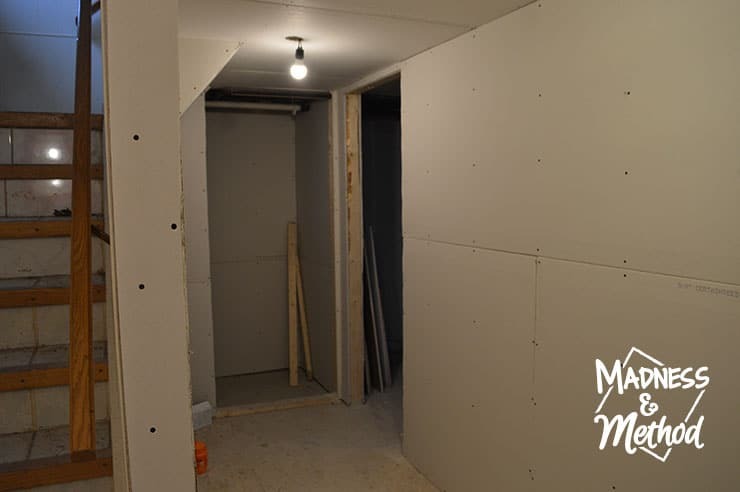 These basement drywall progress pictures show how far this basement has come. 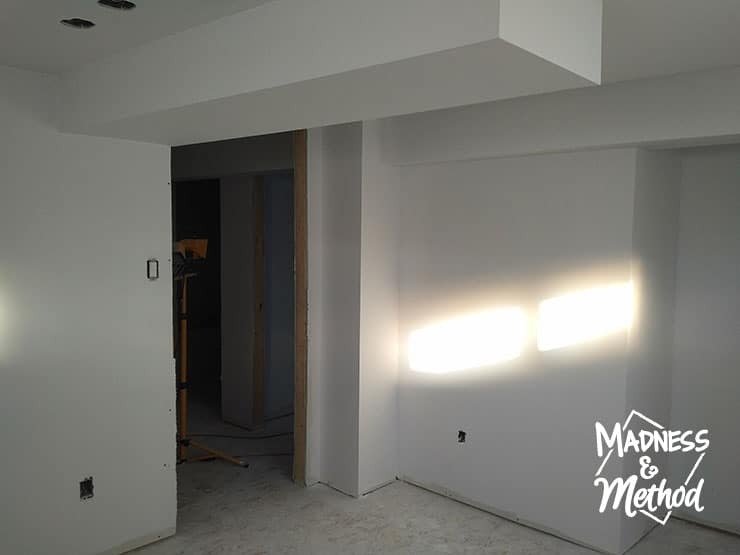 Check out the full tour of the basement apartment before it’s finished! Alrighty, so where were we with the rental renovation? 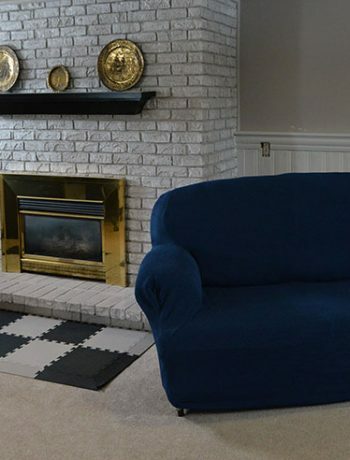 I gave a few sneak peeks of just the living room (with the design plan) a couple of weeks ago, but before that, I had chatted about the back door updates all the way in December. 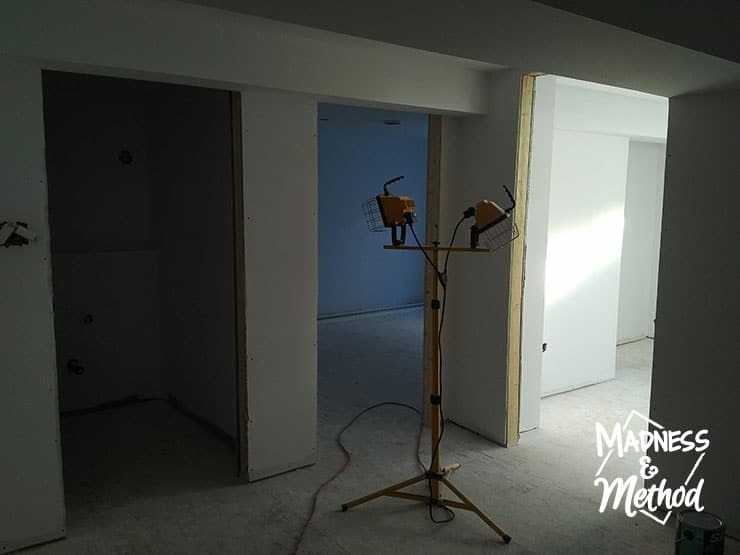 The problem was that our basement sat looking unfinished for a long time, and even though I wanted to have the kitchen completed for the One Room Challenge, things didn’t work out that way. That was definitely the last time I shared any photos of the space here on the blog. I did give some updates on Insta-stories that you might have caught if you follow me on Instagram! 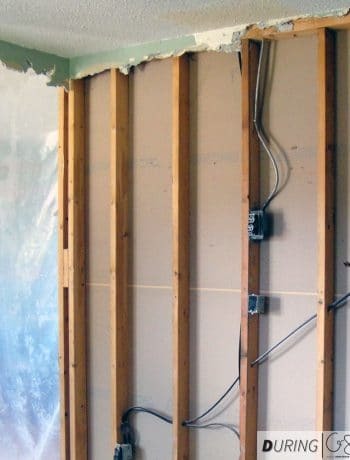 Ready to see the basement drywall progress? I tried to go in the same order that I shared in the original tour of the basement, so essentially as you come into and walk through the space. After you go down the stairs (that are to the right of the back door), you turn the corner and can see the shared hallway. The door at the end goes to the laundry room and the door on the right is the main entrance to the basement apartment. 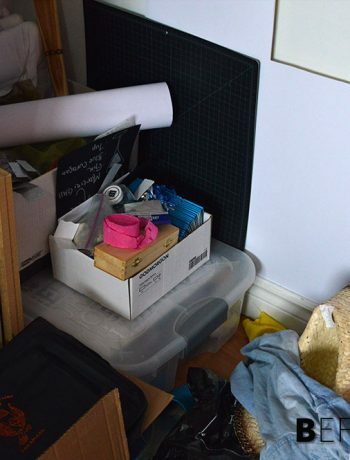 There’s an open storage area below the staircase as well, but I’ll share more on this area once we’ve settled in and have it all cleaned and organized. You come right into the living room and dining space (which is the little corner near the wing wall in the photo on the right) and I shared more photos and plans for the living space here. Walking a bit farther past the wing wall, we have the infamous kitchen area! Doesn’t it look so much better than where we were in October at least? There are no windows in the kitchen and bathroom (and just a tiny one in the living room), but the area gets some natural light from the new windows we added in the bedrooms. Turning around at the end of the kitchen, you reach the little “hallway” area that splits into the bathroom (on the left), the master bedroom (in the middle) and the second bedroom (on the right). The fridge will be placed on the wall to the left here (before you enter the bathroom) so it’s going to be a bit tighter once it’s in. 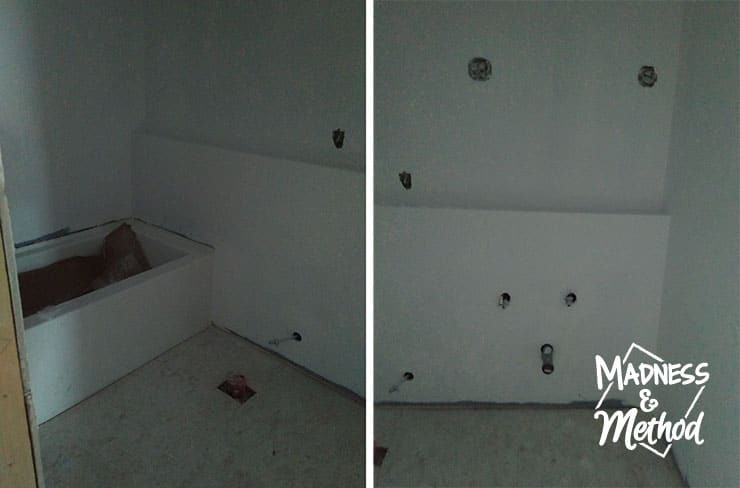 The bathroom is a decent sized 8×5 ish, so we were able to get a full tub, toilet and vanity. I have the BEST plans for this room, so you’ll have to come back in a couple of weeks when I share it (seriously, LOVE how the moodboard is looking). The smaller bedroom (the one on the right) has two windows and will be shared by both littles when we move down here (I’m not looking forward to that!). It does have a nice 5′ x 2′ closet, and is around 10×11 so definitely nothing super tiny. The master bedroom is long and narrow at the end, and it’s a big improvement to how this room looked like when we bought the house. I shared the 2D plans in this post, so check it out if you’re unsure of the layout (some measurements are adjusted a bit, but pretty similar!). 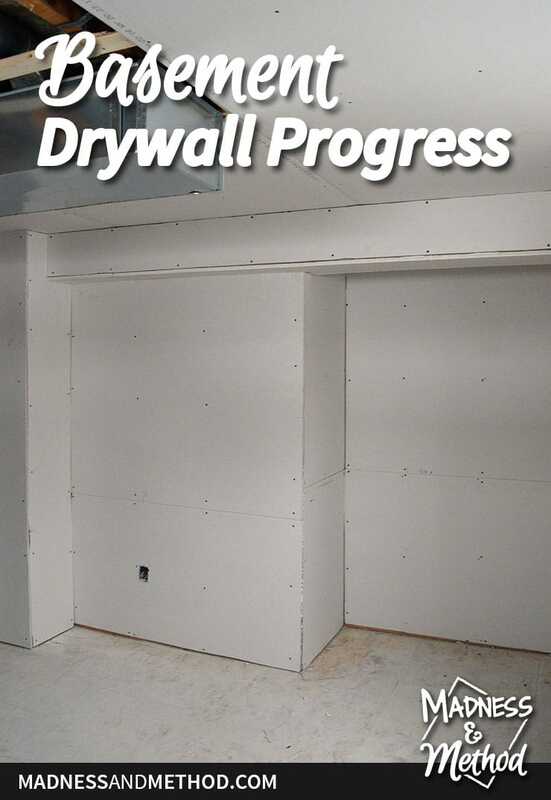 I took these basement drywall progress photos just before Christmas (pre-mudding), and a few of them from a couple weeks ago (after mudding/priming). 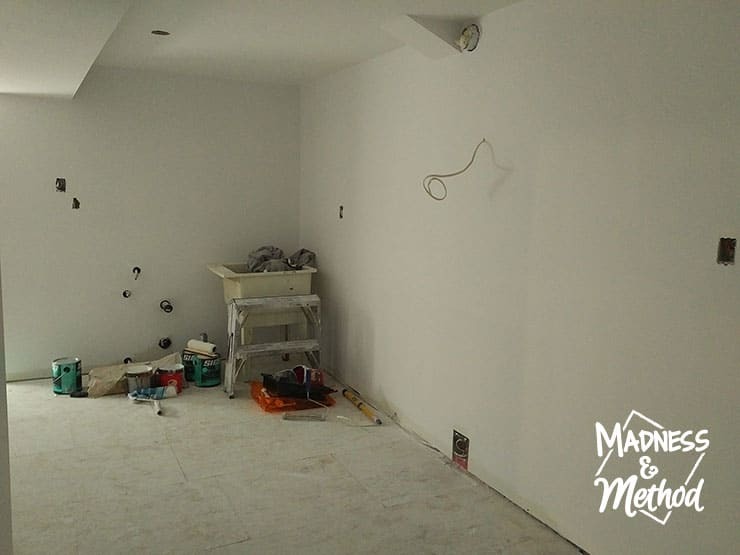 Since then, the walls have been painted and the floors have been installed – so it’s looking a lot more finished! Next week I’ll be sharing how the kitchen is looking now that some cabinets have gone in, but we still have a long way to go before we can move all our stuff down here and get this project finished! (And by finished, I mean at least in a livable state where we can get our final inspections and move in). Thanks, we’re getting closer to move-in ready!